"Blistering heat swelters amidst the very air as the fluorescent green floor glimmers in the glow of summer sun." Sónar is arguably the most important festival in the electronic music and creative arts calendar. The pioneering event celebrated its 24th anniversary this week past and drew in some 123,000 people to the city of Barcelona, the highest recorded attendance at the festival to date. Barcelona as a city makes for a scenic backdrop to four days of music and culture, its narrow sidestreets paired with sprawling hillsides and spacious boulevards are well trodden at this time of year. Bars and cafes spring to life with familiar faces from across the globe whilst the thin breeze from Mediterranean blows softly through the harbour and into town. Fira Montjuïc sits alongside the elegant Plaça Espanya, an open plan square encaved by warehouse space within which treasures lurk. It is here which Sónar by day has populated and across the course of the festival Bjork, Thundercat, Arca, Clark, Denis Sulta, Optimo, Lena Willikens and many more would feature. Upon entry, amidst some thirty plus temperatures, you are met with the overwhelming sense of scale associated with the festival. The towering stage casts a shadow upon the luxuriously turfed dancefloor as sound bounces between walls and out into the realms of the city beyond. The first act of the day, an unfamiliar face, treads carefully between oddball soundscapes and slow moving electronics. She enchants and intrigues, swerving far from the safe route and into weirdo territory. It was a strong statement of intent from Tutu who opened daytime proceedings with profound composure. Soon after this we took the opportunity to meander between the back rooms, cooling down beneath the darkness and stripped back framework. Sónar + D runs alongside the main body of the event, focussing on technology and arts. It is an opportunity for creatives to discover, explore and expand their knowledge in regard to musical science, AV and production. "phosphere" was an installation tunnelled away from the noise of the outside world. 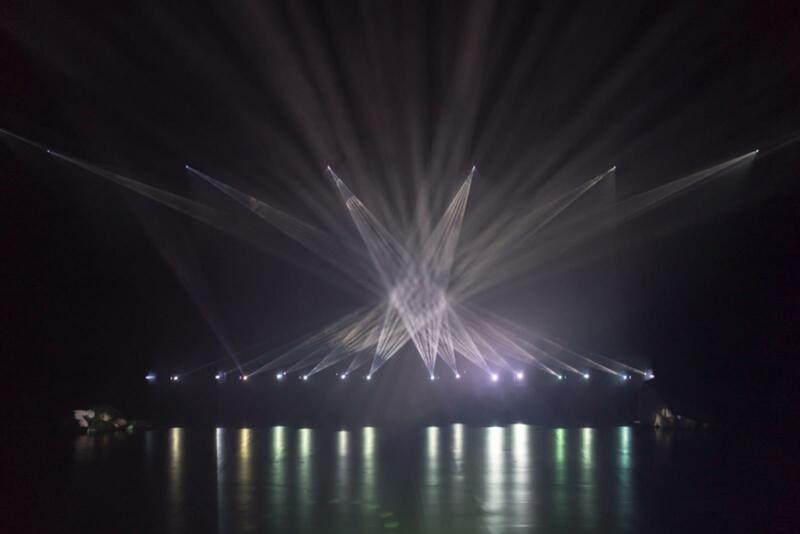 This was Daito Manabe's installation for SonarPLANTA which was designed to give an observers a spatial experience within which dance and light met through the mist alongside intricately functioning video projectors, mirrors, and meticulous optical calculation technology. The space was a welcome escape from the sprawling world of sound and noise outwith, a hypnotic visual and sensory state ensued within which many lay lost in the dark. Following such hypnotic deliberation we resurfaced into the grandeur of daylight. We were met with what was to be perhaps our most triumphant moment of the festival to date. Having released two EP's with Ransom Note Records Bawrut took to to the stage with an enigmatic smile, his first Sónar appearance was a magnificent display of an artist in evolution. A majestic moment for all as the sounds of music previously deliberated over in an office blared out amidst the European sunshine. He stuttered between euphoric disco cuts, tribal percussion and floor focussed dance music and was met with rapturous moves out on the turf. To say it was possibly our proudest moment in the 9 years since this lowly publication came into existence is somewhat of an understatement. Gwan brother Bawut. Elsewhere Dopplereffekt were embarking upon an intricate demonstration of a project titled "Entropy". In collaboration with digital artists and scientists the presentation showcased the capabilities of storytelling across an array of narratives and creation methods, a perfect example of the integration between the musical forefront of the event and the technological architecture which exists behind the scenes. Wandering through the main square Prins Thomas enchanted a crowd of late afternoon revellers with space infused disco and house. Meanwhile Forest Swords breathed life into the SonarHall, the Lynchian red velvet curtains hung elegantly in the grand warehouse. Visuals illuminated the packed space with illustrious delicacy, his new material sounding better than ever as it reverberated from the towering speakers which hung from the ceiling. His new live show was years in the making and his appearance apt and concentrated into a well orchestrated assortment of segments. Shadows moved under the darkness as somewhat eerie images reflective of Manga flashed and moved hazily on screen. A special moment which rounded off a what had been a strong first day. Barcelona is as wholesome as they come. Very few festivals are blessed with such a luxurious doorstep. Losing yourself in the night is an easy feat, groups disassemble as couples explore winding backstreets, culinary delicacies and the atmosphere of a summer night overseas. A chance to reset, recallibrate and recharge before a return to the radiant green tiles and the rally of noise. Entering the SonarHall once again on Day Two we're greeted by our first unknown/unexpected surprise of the day in the form of France's Jacques. Winding through Herbert-esque 'Transversal Techno' this is up there with any discovery we've made so far this weekend. Cobwebs blown away that had been lurking from day one, we venture to the now more readily used SonarComplex to encounter the indescribable sound of Elysia Crampton. Shamanic collision is how it's referenced in the programme and that's probably about as close as you can get to summing up what happened. Inter-weaving ethereal vocals with a sound clash of rhythms and Keytar, it's an un-nerving yet engaging trip. A darkened room in the middle of the day never felt so good. Outside, amidst the dripping heat, Pan Daijing is twising the SonarDome out of proportion. A wall of darkened, cinematic noise behind a mask beckons. We're left bewildered yet highly energised by the whole thing. Suitably inspired, now was the time to divulge ourselves within the backdrop. Sónar + D comes to life amidst the day as crowds scutter like ants between stalls, conversations held here spark the imagination, open possibilities and defy the conventional nature of festivals. Elektron, Roland and Native Instruments were all in attendance showcasing some of the most innovative new equipment in sound production. However, the stall which captured our utmost attention was that of the Kickstarter powered Dada machines. 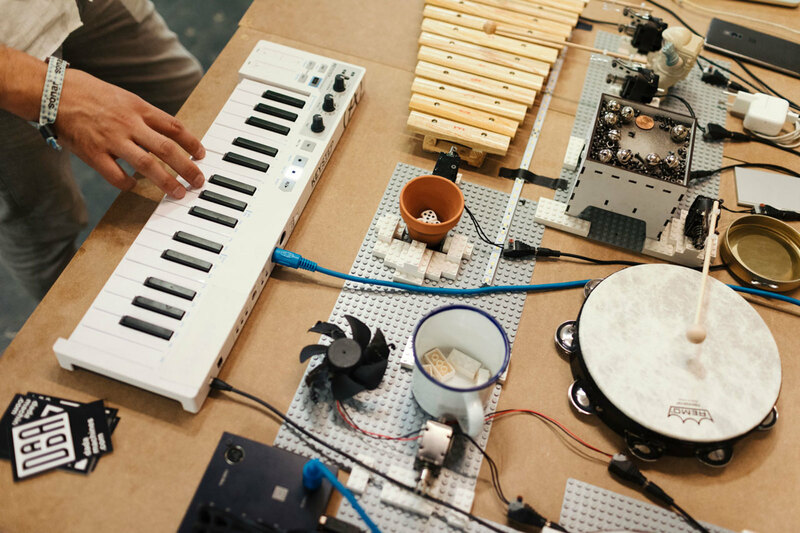 The pioneering production company showcased robotic instrumentation and midi sequencing at the MarketLab in what was the most intriguing stall of the day. Evolutionary technology personified. 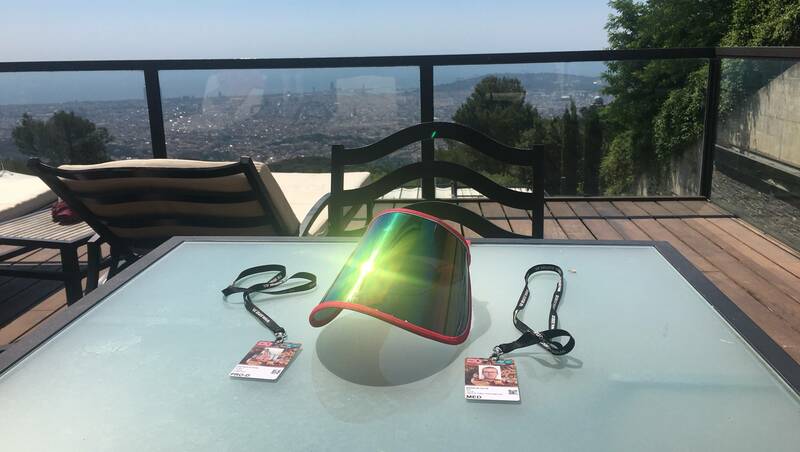 Oh and a free visor - see final picture - from the ace Sound Cool collaboration software which makes more than one outing throughout the weekend. Channeling the essence of experimental electronics and futuristic thought we meandered through the crowds back to the SonarHall. Clark is as innovative and relentless as they come. A nervous sense of expectation hung in the air prior and gave way to what was possibly the highlight of Friday's daytime escapades. As night fell our thoughts began to drift. It can be hard to maintain concentration amidst such an expressive environment. Between sun-kissed dancing and a sensory overload one's brain tends to weave and wind, much like our course through the following night. The early hours of Saturday morning were spent lost in a dream like haze, soundtracked by the music of Jon Hopkins, Moderat, Masters At Work, Derrick Carter, Nina Kraviz, Clams Casino, Nicolas Jaar and Soulwax. Sónar by night takes place at Fira Gran Via, a sprawling maze of futuristic warehouse space and metallic framing. The clatter of drums and nightlife tunnels its way between rooms as swarms of people descend into the bleak darkness, illuminated only by flashing lights. Focus is lost as weary feet move back and forth. 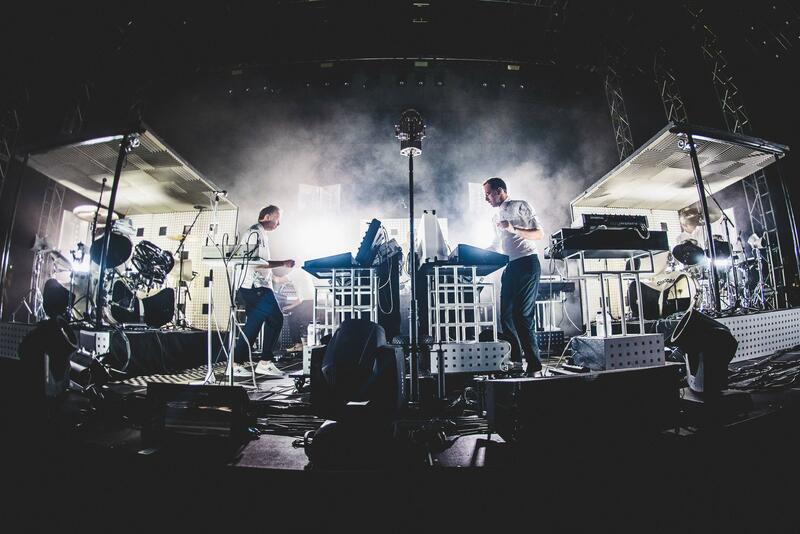 Soulwax glimmer with prosperity, powered forwards by three respective drummers who clatter orchestrally in time - three drummers in time the whole way through is no mean feat. Good and evil, white and black, darkness and light: themes which flicker throughout their regimented performance as they march to the beat of one very loud kick. Exceptional. Nicolas Jaar teases a vast crowd with precision and focus. Playing live he lulls the crowd into a false sense of security before revelling in the joy of bringing them up to a climactic whirlwind of noise and dance. Walking home through the backstreets of this beautiful city the night leaves us perplexed, caught up in a maze of movement, sound and nighttime dreaming. Saturday sees the festival draw to a gracious close. Days and nights spent dancing beneath the burning sky has taken its toll on several weary eyed faces lost within the crowd. As we walk into the open square for one last time there is a kindred spirit afloat. Sónar brings together a community in a way dissimilar to any other musical event in the calendar, it is the culmination of commitment to an industry: one people, one place. Veronica Vasicka eases us in from the night before as she playfully fragments between experimental synth jams and fast paced techno. She works it beautifully with layered samples and euphoric crescendos. A crowd on its last legs begins to rise to the occasion once more as the late afternoon sun glimmers through murky windows up above. Thundercat and Joe Goddard also cast an discerning spell upon the final proceedings. Their personalities glimmer upon tall stages with each artist seeming to be remarkably humbled by what lies before their line of sight. Goddard in the late sun revitalised everyone in site. Optimo conclude the daytime venture. The Glaswegian duo are celebrating their 20th anniversary and have been granted the honour of the sunset slot as Barcelona lets out one last rallying cry. Shadowy dancers sweat beneath the final rays of heat as cries echo desperately into the late hours. Optimo sparkle with pride as they reservedly do what they do best. Records spin and the end falls nigh. Slayer rings out unexpectedly, the death cry of a sunlight dancer personified. That night Avalon Emerson, Daphni, Hunee and and more all played into the small hours. Their appearances a final roll of the dice in what had been a cultural awakening. Sónar is a treasure, a rare glimmer of hope which represents international spirit and like-minded passion side by side. This year like any other was no exception. On Sunday morning, as daylight eased its way through the cracks their was a sense of overwhelming calm as silence fell. The dancing stopped and the 24th edition fell silent, a city united by a four day experience which left us liberated and thankful for dance, music and culture.